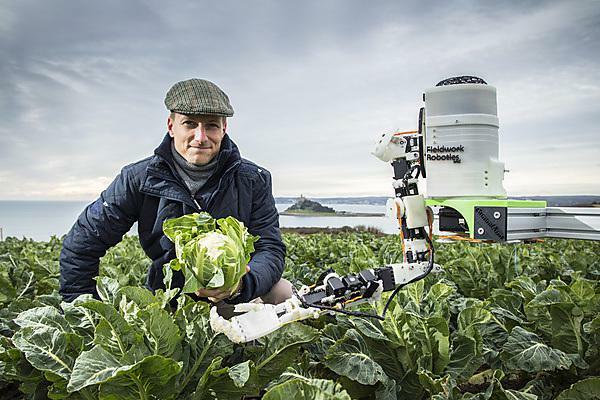 A University of Plymouth spinout company developing robotic solutions for the agriculture and produce industry is to receive increased support from the University’s commercialisation partners, Frontier IP. Fieldwork Robotics has been incorporated to develop and commercialise the work of Lecturer in Robotics Dr Martin Stoelen and his team, who are developing soft, adaptable robot arms and highly sensitive grippers able to handle delicate items. Frontier IP, which specialises in commercialising intellectual property, has agreed to provide extra development and engineering support to the company in return for increasing its stake from 21 per cent to 27.5 per cent. The move will enable Fieldwork to accelerate development of its agricultural robots, following interest from the industry, and will allow Fieldwork to develop a proof-of-principle, field-test-ready prototype robot for harvesting vegetables. Dr Stoelen, founder and director of Fieldwork Robotics, has previously developed technology that can harvest soft fruit, and is now refocusing that to assist with the picking of cauliflower, broccoli, kale and cabbage. He has also received funding from Agri-Tech Cornwall, a three-year, £10 million initiative part-funded by the European Regional Development Fund, with match-funding from Cornwall Council. The agricultural sector is increasingly interested in robotic applications to overcome problems in recruiting labour, reducing wastage and improving margins. This project demonstrates the flexibility of the Fieldwork system, where the grippers and tools at the end of the arms can be changed for different applications. Work is well advanced on a soft-fruit picking robot, which has attracted considerable interest from leading producers. Three patents have been applied for and Fieldwork has a licence from the University of Plymouth to use the intellectual property relating to the system’s robotics.